The ''Bed of Nails'' is another in the range of original fashion accessories which you can make yourself using the new Preciosa Villa™ bead by following this tutorial. This thin glass pyramid has dimensions of 6x13 mm. 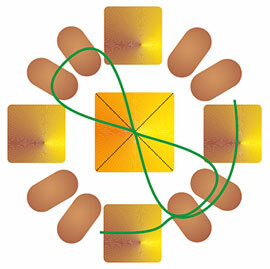 The hole passes diagonally through the square base. 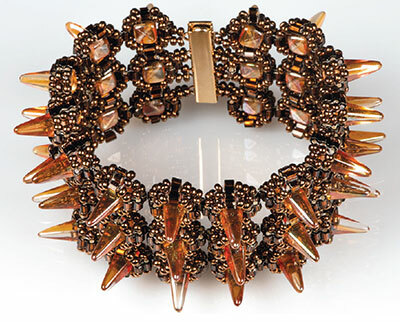 The hole's very low position enables the connection of individual beads and sewing around them with small Preciosa beads and seed beads. 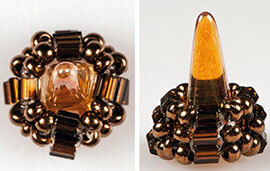 This new bead has supplemented the range of fashion and popular costume jewelry accessories and in doing so has unveiled further options in the production technology used for pressed beads. The edges of the pyramids especially stand out in opaque colors or when used with all-over surface finishes. Enchant your friends with a unique piece of jewelry. You can also create it in simplified single-row or double-row variants. Unleash your imagination and try out different color combinations using the wide range of Preciosa Traditional Czech Beads. Preciosa Ornela wishes you many creative ideas and much inspiration. Sew around each new Preciosa Villa™ (V) in the shape of a slim pyramid separately. Sew a total of 42 points (14 columns and 3 rows). Start by sewing around the initial ring. String T-C, 2xR, T-C, 2xR, T-C, 2xR, T-C, 2xR and tie them off (fig. no. 1). String 1xT-C and 2xR. String 1xV and insert the line into the adjacent two rocailles. Return to the V and the previous two R, but from the opposite side (fig. no. 2). Add T-C above the following T-C. String 1x T-C and insert the line into the initial T-C from the other side. Pass the line through another 2xR. String 3xR and return again to the initial 2xR from the opposite side. 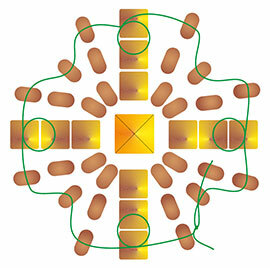 In this way, you will sew around the initial ring and start the second row (fig. no. 3). 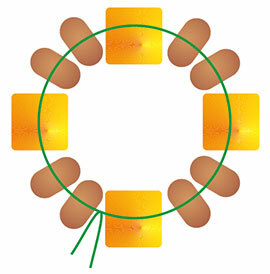 From the initial ring, thread the line downwards through 2xR in the loop created from the 5xR, including the top one. String 1xR, T-C and insert the line into the T-C from the second row as if in the opposite direction. Return to the strung T-C. String 1xR and thread it through the next top R from the following loop of the fifth R. In this way, you will sew around the entire circumference and start the third row (fig. no. 4). Sew each new point to the previous one. When you reach the T-C in the third row, thread the line through it. Add the T-C in the third row from the already sewn on point in the bracelet. Thread the line through it from the other side and return to the T-C from the sewn on point. 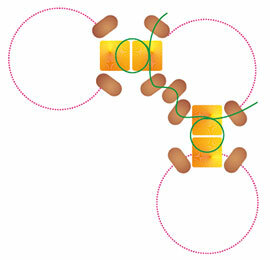 Affix some of the sewn points in one place and others in two places according to their placement in the bracelet (fig. no. 5). Sew the line in (tie a knot) between the rocailles. Otherwise, you can insert it into the opening in the T-C.
Sew the fastening on next to the outer side points. Insert the line into the rocaille in the loop consisting of five R which is facing with its opening downwards, perpendicular to the backing. String 2xR. Thread the line through the fastening eye and add another 2xR. Once again insert the line into the rocaille with the perpendicular opening, but from the other side. Thread the line through the created loop once again. The used fastening has four eyes on each side. 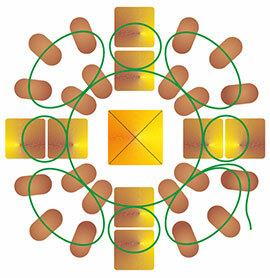 Two of them are fastened to the central point, while the outer ones are attached to the outer point. Tip: If you have less time, create a single-row (from 14 points) or a double-row (from 28 points) bracelet. Also try other color combinations.